Get to know one of our awesome Team Members, Heather Hilton! We have an amazing, dedicated and talented team of moms here at FIT4MOM LSBWK NoVa, and we want you to get to know a little more about each one of them. 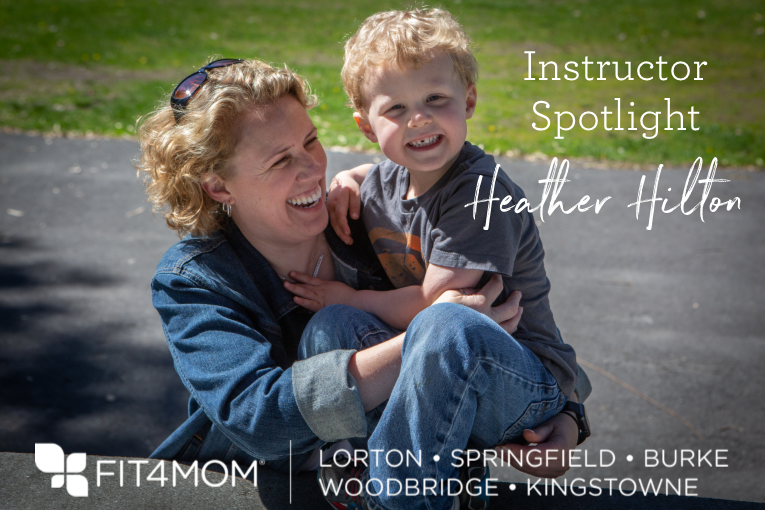 So for January, we'll put the spotlight on Heather, Stroller Strides Instructor for our Woodbridge Village weekend warriors. 1. Who are the members of your family? Noah (4yo) and I are a family of two! I am a Single Mother by Choice (a Single Mother by Choice is a single woman who decides to become a mother knowing, at least at the outset, that she will be the sole parent of her child), and Noah was conceived by IVF. 2. Where are you from originally and how long have you lived in NoVa? I was born and raised in the beautiful state of Maine. I’ve been in NoVa since 2008, but would go back North in a heartbeat if my job were there! 4. Tell us your story about how/why you became an instructor for Fit4Mom LSBW NoVa. I work full time, and I couldn’t find any options when Noah was born for a good “mommy and me” workout on the weekends—until I discovered Fit4Mom. After about a year of going to SS, and a round of BB, I wanted to help give other weekend warrior workout Mamas the same opportunity I found with Fit4Mom. 5. What is your favorite thing to teach? I love weekend SS. Sometimes it is the only hour my Mamas get to give themselves, and I love to see them get the most out of it. 6. What is the BEST thing about being an instructor? My favorite moments are when a new Dad joins us for the weekend family class—the look on his face is priceless when he suddenly realizes we are not just strolling around the mall drinking lattes! It’s even better when Dad keeps coming back for more—what a beautiful thing to see a family getting healthier together. 7. What is your WHY? Why do you keep doing what you do? My why is simple. Noah. Isn’t it amazing how everything changes when our littles arrive on scene? 8. What is one of your current wellness goals? I had surgery in July, repairing a 15-year old labral tear. As a result, I was immobile for quite some time. Now it is time to get back to where I was pre-surgery, and maybe even pre-injury! 9. What is a fun fact that many may not know about you? I’ve lived overseas in England, Belgium, and Israel as a student; in Korea, Kuwait, and Iraq as a soldier; and in Australia as a rambler.